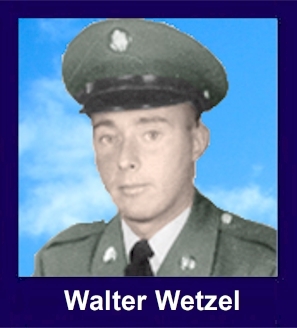 The 35th Infantry Regiment Association salutes our fallen brother, PFC Walter Joseph Wetzel, who died in the service of his country on May 29th, 1966 in Pleiku Province, Vietnam. The cause of death was listed as Small Arms/AW. At the time of his death Walter was 21 years of age. He was from Howard Beach, New York. Walter is honored on the Vietnam Veterans Memorial at Panel 07E, Line 124. The decorations earned by PFC Walter Joseph Wetzel include: the Combat Infantryman Badge, the Parachute Badge, the Bronze Star, the Purple Heart, the National Defense Service Medal, the Vietnam Service Medal, the Vietnam Campaign Medal and the Vietnam Cross of Gallantry with Palm Unit Citation. Joe - we knew him by his middle name - was a good athlete and had a great humor about him. He played basketball with us at the St. Francis de Sales school yard in Belle Harbor, NY and football at Far Rockaway H.S. Joe was the first of several friends I lost in Nam and he was on my mind frequently when I served there. As with all others, he was too young to have died. Our prayers are with him.